Dayna has a great passion for working with the elder population, influenced by the caring and supportive relationship she had with her grandparents. Since their passing Dayna has been a caregiver, volunteer, and case manager while working with the 60 and over population. When Dayna completed her Bachelor’s Degree in Psychology, she quickly applied for the MSW program at SDSU in the hopes of furthering her education in social services. During the 2016-2017 school year, Dayna interned at Serving Seniors; serving low-income senior populations through case management, support group facilitation, and person-centered therapeutic relationships. Currently, as a part of HRSA GWEP Alzheimer’s MSW Stipend program, Dayna is interning at Southern Caregiver Resource Center (SCRC). SCRC serves family caregivers of individuals needing assistance with at least two or more ADLs and/or cognitive impairment. 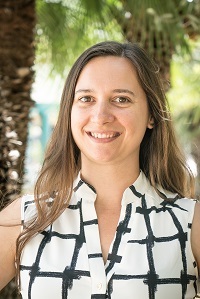 As an intern at SCRC she will be acting as a Family Consultant; conducting client intake and needs assessments, service referrals, psychoeducation, co-facilitating support groups, and supportive counsel. With aspirations of advocating for the elder and mental health populations, Dayna is excited about the learning opportunities presented to her through the SDSU program and her internship at SCRC.